BlackBerry PlayBook and future QNX-based BlackBerry Smartphones to run Android Apps too?! Pure awesomeness. Back on August 25th on CrackBerry Podcast 057 (jump to minute 52), prior to the PlayBook ever being announced, we spent a bunch of time weighing in on the BlackBerry tablet rumors of the day. I squashed a bunch of them - like the fact it would NOT be called the BlackPad (I still chuckle at that one) nor would RIM brand it the QNX OS (it was introduced as BlackBerry Tablet OS). I also talked about the QNX-based operating system, and how it would definitely be on BlackBerry Smartphones down the road (now confirmed). And I also made a bet with our own Bla1ze that the QNX OS would be capable of running Android apps down the road, should RIM choose to make that happen (obviously they want to build out their own app ecosystem via App World, but if you can support another one, why not?). And well, I don't usually make bets that I won't win - even in August I had heard RIM's new tablet could run Android apps, but the big question then and now is whether RIM would want to do that, even if the platform could do it. Today Jonathan Geller followed up on this, stating he's confirmed with multiple sources that it's looking like the BlackBerry PlayBook and future BlackBerry Smartphones running the QNX-based OS may be able to run Android apps via a Java Virtual Machine. RIM has stated a Java VM is coming to support legacy BlackBerry apps, and it seems RIM may choose to implement the Dalvik JM which Android utilizes (the final decision having yet to be made). Assuming RIM goes this route, you may just be able to run Android apps on your next BlackBerry. You can follow the link below for BGR's full take on it. Be sure to sound off in the comments on this one. 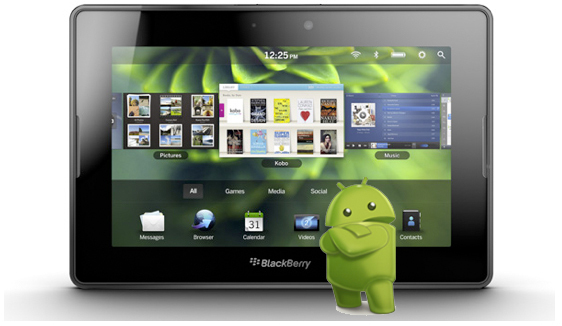 How would you feel about a BlackBerry PlayBook or Smartphone that could ALSO run Android apps?? Could be pretty awesome, don't you think? Let's make it happen RIM!